This cross of nails is a reminder that our salvation was paid by a high cost, a death on a cross, for those who were lost; but now can be free because of Calvary. Cross Pendant measures 1 3/16" tall x 3/4" wide (1 1/2" tall with hoop/bail). 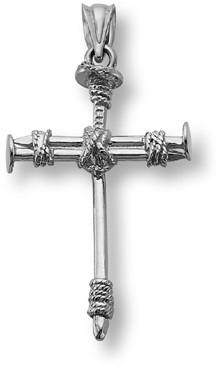 We guarantee our Cross of Nails Pendant, 14K White Gold to be high quality, authentic jewelry, as described above.